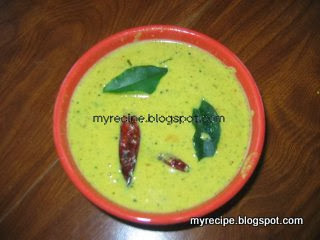 Kalan This dish mainly from Kerala Nambuthiri( Kerala native Brahmins) They use pepper instead of chillies. Now we use pepper and chillies for this recipe. 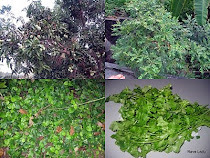 This kalan is main dish for Onam festival. Cut the yam /banana into small pieces and cook them in water and remove the water. Grind the coconut, chilli into coarse paste and mix with the buttermilk. Boil it,When it becomes thick add salt and change the kalan in to a serving bowl. Heat a pan with oil add mustard, chilli and curry leaves. When it splutters add to the kalan. You can keep this kalan for one month. Eat with rice and roasted pappads.